Today we're continuing to countdown of the 10 most exciting, cutest, noteworthy and/or memorable ways that 2013 is one year that we won't forget. Technology is always evolving and that means we have more and more impressive ways to share the unbelievable underwater world. This year we had help from underwater photographer Keith Ellenbogen and MIT physicist Allan Adams with tech support from Jason O'Connell at Tech Imaging Services. Remember this? As we explained in this media release, this jaw-dropping, split second footage was shot at 500 frames per second versus the normal 30 frames for video. 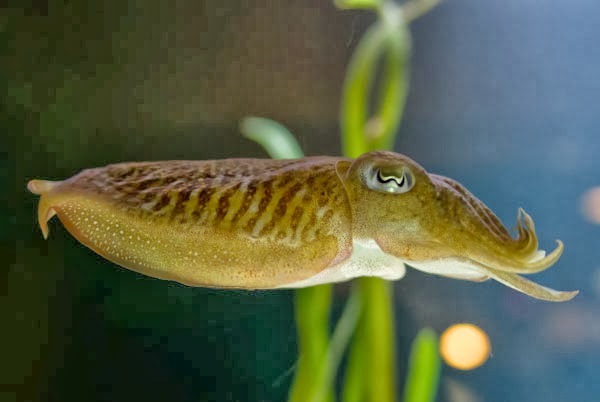 It shows how these cunning cephalopods capture their food, with two retractable tentacles snagging a fish and pulling it into the grasp of eight waiting suction cupped arms. Ellenbogen and Adams also pointed their lens at the goosefish, the lionfish and other animals throughout the Aquarium and our off-site holding facility. In fact, these incredible clips also spawned our first television ads in decades, which tout the New Aquarium Experience (more on that later in the series, of course)!